With the number of new biologics being approved each year quadrupling since 2004-2008, biotherapeutics have become an important segment in the pharmaceutical industry. SCIEX has prepared for this market dynamic by developing innovative technologies to enable scientists to perform routine biologics analyses faster, and provide next level tools to answer the difficult questions easier. 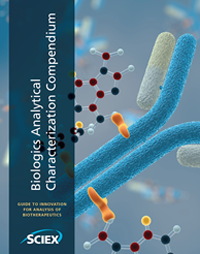 Download the SCIEX Biologics Analytical Characterization Compendium today to learn how to speed your routine workflows, and to simplify your challenges.